Britain has curried a strong reputation for good sportsmanship. Strongly influenced by His Lordship Sebastian Coe, they're outspoken against doping, but fixated on Russian devils. Not enough care is directed to avoid tarring innocent athletes with doping accusations. Coe himself is insecure, his personal achievements tarnished from boycott-depleted competition in the Moscow & Los Angeles Summer Olympics. Britain should look objectively at mighty ally America, which for many years has shielded admitted drug-cheat Lance Armstrong from justice. 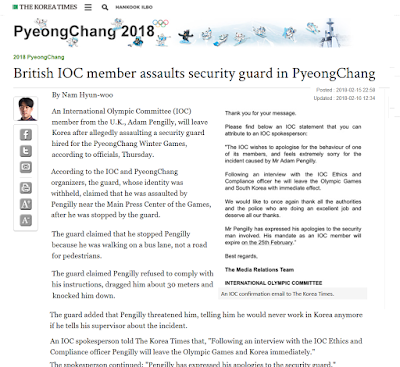 Will we ever see the video evidence of International Olympic Committee member Adam Pengilly's altercation with Pyeongchang Winter Olympics security? Pengilly admits multiple lapses. He claims there was no physical contact. Yet he was ordered home and quickly bundled away, his actions reported in the UK as disgraceful. Pengilly is one of just twelve elected IOC Athletes' Commission members, and thus also one of only 100 IOC members. He was elected to an eight-year term from the 2010 Vancouver Winter Olympics. It seems the British hope his case is quietly forgotten and he's allowed to finish his term. We want Olympic Games success. But is coverup proper accountability? 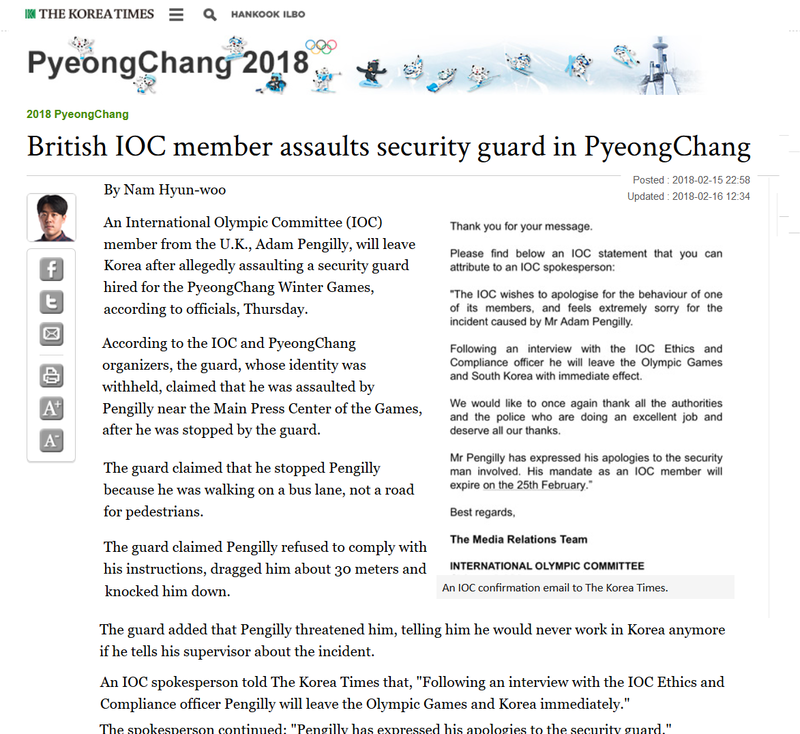 "British IOC member assaults security guard in PyeongChang"
The Korea Herald is also markedly more condemnatory. At least one ally has tried to portray Adam Pengilly as a victim of the IOC -- rather than an arrogant bully above security checking or censure. What Happened? Should Adam Pengilly face criminal charges?